Under the direction of Bruce Dickey and Charles Toet, Concerto Palatino has been a leader in the revival of the cornett and baroque trombone (or sagbutt). Their highly acclaimed concerts and recordings have brought an appreciation of their important but little-known music to modern audiences, and stimulated many young players to take up these instruments, practically unknown a generation ago. Bruce Dickey and Charles Toet have been central figures in the modern revival these instruments and are largely responsible for the enormous advances in playing standards. In a collaboration of some twenty-five years, they have together trained a whole generation of cornetto and trombone players, many of whom have become regular members of Concerto Palatino. The group takes its name from a historical ensemble of cornettists and trombonists which existed in the city of Bologna for over 200 years under the name Il concerto palatino della Signoria di Bologna. Following in the footsteps of these former virtuosi, their aim is to restore these instruments to an active and respected place in concert life, and to cultivate a love of their music among audiences and players alike. 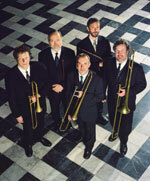 While the core group comprises two cornetts and three trombones, this formation is frequently augmented by the addition of extra brass players, or strings or singers as necessary. Inevitably, much of their repertoire is sacred, as these instruments were a fixture of musical chapels in both the Catholic south and the Protestant north, from the time of the first flowering of Flemish polyphony in the early sixteenth century through their twilight years at the time of J S Bach, one of the last composers to employ them in a serious way. Concerto Palatino places a high priority on unearthing neglected gems of music history and giving them a place in the concert hall and recording catalogues alongside the works of established masters. Thus, in addition to highly acclaimed recordings of Schütz, Gabrieli and Monteverdi, they have made premiere recordings of the Marian Vespers of Francesco Cavalli, the Missa Maria Concertata of Christoph Strauss, and Palestrina’s Missa sine nomine preserved in a manuscript of J S Bach.